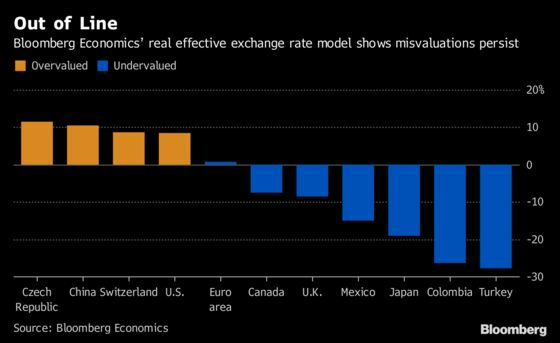 (Bloomberg) -- As the opening shots are fired in a global trade war, Bloomberg Economics’ fair value model for currencies indicates which ones are already pricing in the risks. China’s exchange rate appears too strong and Mexico’s peso may have overreacted. The U.S. dollar is about 8.5 percent overvalued and could be supported by turmoil in the global economy, while the euro is close to fair value, though it may weaken as the trade war continues.